Are Chihuahuas good family dogs? What were Chihuahua dogs originally bred for? The lovely Chihuahua is a tiny and portable dog. In this guide, we’ll talk about the Chihuahua’s good points and bad. We’ll look at their temperament, health, and a few special needs. We’ll talk about different types of Chihuahua. And discover some cute Chihuahua mixes. You’ll also find reviews of fun products that you can buy for your Chihuahua. As well as tips for caring for your tiny friend. Let’s begin by finding out where Chihuahuas come from. There is some debate about the origins of the Chihuahua. Most people assume they come from Mexico. The land who gave the Chihuahua dog their name in the late 1800s. However, it is quite possible they came along at this point from another country. Some of their ancestors may also have been native pet dogs. The Techichi dogs of the Toltec civilization are very similar. This would mean the breed has been in Mexico for a very long time. Possibly thousands of years! Some people believe they can trace the Chihuahua’s ancestors back to the 1500s. Whatever their origins, these tiny dogs have been lovingly bred for generations. And are now one of the most wanted Toy breeds in the world. Britney Spears, Demi Moore, Paris Hilton and Madonna. They have all been pictured with their Chihuahuas. You can bet photos of Chihuahuas with celebs has helped to increase the popularity of these little cuties. Despite his tiny size the Chihuahua is as much a dog as any other breed. These little dogs enjoy doggy activities, and have a long history of being friends with humans. 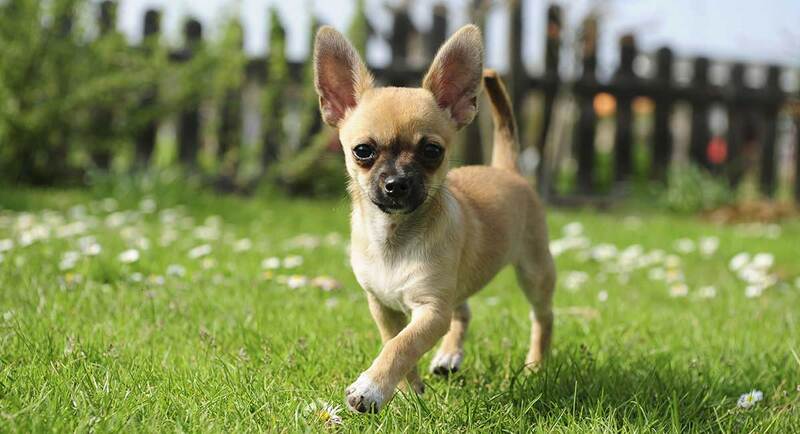 Although small in size, Chihuahuas have quite a loud bark and are great watch dogs. In this way, they are like many terriers. And it’s something to consider if your neighbors are not keen on noise! Both the USA and UK Chihuahua breed clubs put a top weight limit of 6 lbs on the breed. Despite this, many pet Chihuahuas weigh more. And that is not a bad thing if the dogs in question are not fat. The Chihuahua has an apple-shaped dome, fairly short muzzle and round but not protruding eyes. There are some Chihuahuas with flatter, less domed heads. These are known as Deer Head Chihuahuas. Some people prefer the dogs with flatter heads. Large upright ears complete the look. 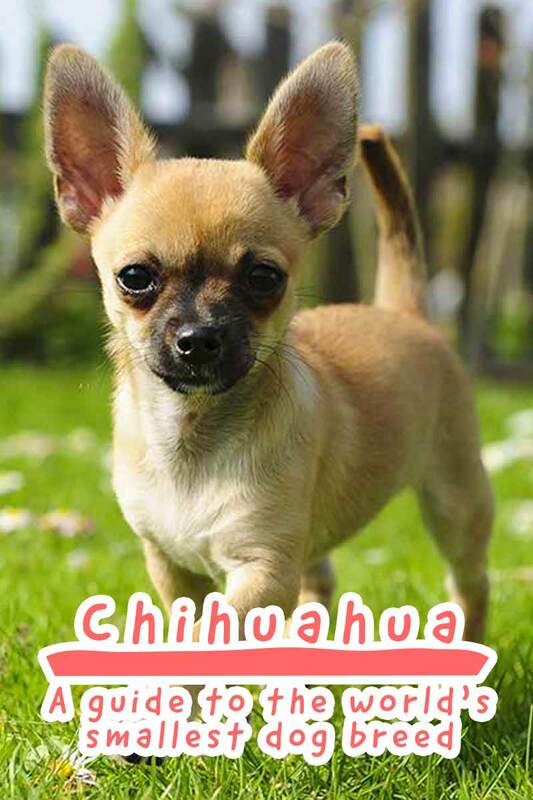 They also add to the Chihuahua dog’s ‘cute as a button’ appeal! Fans refer to very small dogs of this breed as teacup Chihuahuas. The teacup Chihuahua is not a separate breed of dog. It’s just a way of describing much smaller pups. Sadly there are some problems with teacup Chihuahuas. It’s important to read up on these if you’re thinking of taking on a teacup. Chihuahuas are split into two coat types, short-haired and long-haired. It is thought that the short-haired variety came first. A short-haired Chihuahua’s coat will be smooth, soft to the touch, close and glossy. They come in a wonderful variety of colors. Check out our guide to brindle dog breeds to learn more! The long-haired Chihuahua is the same size and shape. They simply have longer fur. This should be soft and flat or slightly wavy. 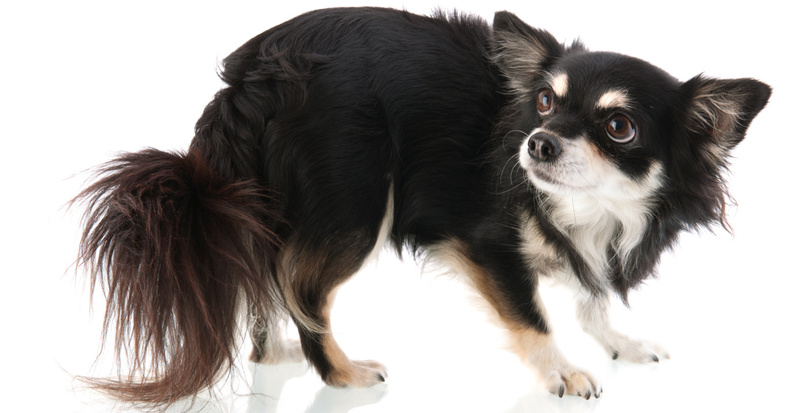 Long haired Chihuahuas have more fur on their ears, legs and tail too. Other than that, there is really no difference between them! You may have heard that this breed can be grumpy or even prone to snap. There is some truth in that, but there are many friendly Chis too. Chihuahuas have a terrier like temperament. With their long history as companion dogs, many Chihuahuas are loving and devoted to their owners. This devotion can however lead to guarding. This in turn can lead to growling, and even snapping. They also seem more capable than some other breeds of turning on their owners. A 2008 study found that chihuahuas were one of the most aggression prone breeds. This included attacks on both strangers and their own families. They are also prone to injury due to their tiny size. Sadly for all these reasons they are not recommend for homes with kids. Some chihuahuas are easier to train than others. Some work at advanced levels in competitions or on TV. However, your devoted Chihuahua friend may show his loyalty with unwanted guarding, or be difficult to potty train. He also will need socializing thoroughly as a puppy. It’s important to get good training advice from the beginning. Due to their small size, Chihuahuas don’t need a huge amount of exercise. Regular but light exercise will also help keep this dog in top condition. The Chihuahua is not just small. He is also fragile and prone to broken bones. These dogs are at risk of injury from being knocked or dropped by their human family. Falls and other accidents in the home can be serious. Tiny dogs are also at risk from other dogs. A bouncy larger dog could pick a chihuahua up and shake him. You will need to be careful when out walking. Mind who you allow your dog to approach or play with. You can’t be as off-hand as you might be with larger dogs. This is most true with Chihuahua puppies, they’ll be even tinier! Potty training very tiny dogs can be a little more tricky. You will need to be patient. Very tiny dogs have very tiny bladders. They therefore need to empty them more often. Be patient and persistent. Follow good potty training rules, and you’ll succeed. Most Chihuahua health problems are due to their size. Being on the small side is a health advantage when it comes to dogs. But being very tiny indeed, is not. Hence tiny dogs share a range of sometimes serious health problems. And many have severe dental problems too. Let’s look at those first. Extra dental care is needed for tiny dogs. Their teeth get crowded together in their little mouths. This crowding makes decay more likely. This breed needs all the help it can get against dental disease. But daily toothbrushing is a must. However, it can’t ensure good dental health. Diet can be an ally in fighting tooth decay. Steer clear of sweet treats. Food high in sugar content could make dental issues more likely. Your Chihuahua will need regular dental checks. Keep an eye on his mouth yourself too. This way you can spot early on if it looks bad. Dental work can then be carried out early. Chihuahuas also suffer from difficulty giving birth. They often need assistance. Why this happens exactly isn’t incredibly clear. Breeding for this head shape, sadly, isn’t helpful when it comes to health. This is vital to keep in mind if you intend to have puppies. She will need extra care during birth. This is likely to mean additional costs. The Chihuahua is also more prone to stress injuries like patellar dislocation. This is where the kneecap pops out of place. There are some other common health concerns. These include epilepsy and low blood sugar. There is also tracheal collapse. It’s usually possible to avoid very low blood sugar by feeding your Chihuahua little and often. In other words, more small meals rather than one or two larger meals each day. There is also the danger of necrotizing meningoencephalitis. In this illness, brain tissue swells and dies off. This results in random and strange movements. It can also bring about severe pain. Chihuahuas have this risk in common with some other toy breeds. It’s likely also a result of their small heads. Don’t forget, if you have any worries about your dog’s health, your vet is the person to contact. Chihuahuas can easily be poisoned by quite small amounts of chocolate. Or indeed any other substances that are toxic to dogs. This is due to their size. Be very careful to avoid your Chihuahua eating chewing gum. It often contains xylitol, which is a poison to all dogs. We’ve seen many claims for long life in Chihuahuas. But a study published in 2010 looked at 407 Chihuahuas including 71 death reports. The study found that Chihuahuas have an average lifespan of about 12.4 years. Despite this, the Chihuahua lifespan is by no means the worst dog breed when it comes to a long life. Short haired Chihuahuas are very low maintenance. They don’t need much grooming. Still, it’s good to get any dog used to having a brush run through it’s coat. If you are busy, the short haired Chihuahua will be fine if you skip a few days. Their long-haired cousins will require more frequent brushing. Their fur may also need a light trim to keep them in good order. Chihuahuas are fragile and easily injured if dropped by children. Children under the age of seven also can’t control how tightly they grip your little dog. They can hurt them. For this reason, and because of the possible aggression and guarding problems mentioned above, the Chihuahua is not recommended as a family pet. Make sure you pick a breeder who is open about health testing and parents’ background. The parents of your puppy will help to give you a good idea of the puppy’s future nature. It is a good idea to ask to meet both parents. Make sure they are each friendly when you see them. But temperament is only partly inherited. The way puppies are raised is important too. Being very thorough with socialization is the key to a friendly dog. This will help to avoid the puppy growing into a snappy or grumpy adult. If you are thinking of getting a Chihuahua do consider rescuing an older dog that needs a home. Consider adopting a Chihuahua from an animal shelter. There are many small dogs waiting for a loving home. Do you know about a breed rescue that’s not on our list? Comment below and let us know. TIP: Bringing home a rescue Chihuahua? A great way avoid ‘accidents’ is to treat them like a puppy. They won’t instinctively know where you want them to pee. Let them out often. And keep them on a washable floor until they have settled in. Don’t be sucked into buying a puppy from very tiny parents. Slightly larger dogs may even be healthier. More space in the skull and mouth will help ensure a better quality of life. So it’s a good idea to avoid any breeder that is selling ‘teacup’ Chihuahuas. A bigger dog will have a better chance of a long and healthy life. Are you interested in a mixed breed Chihuahua? We compare the Chihuahua with the Shih Tzu. Which breed is right for you? If you’re thinking of getting a Chihuahua you might also like to consider these other small breeds. Chihuahuas don’t suit homes with kids. But they can work well for some adult only families. If you are looking for a very small and devoted companion dog, this could be the breed for you. Be aware of the need to avoid accident and injuries both at home and out on walks. And of the risk of aggression in some dogs of this breed. Don’t forget to tell us all about your pet. Tell us how old your little dog is and what you like best about them! You can share in the comments box below. and I love them to death. Goes I’m an animal lover anyway I have three dogs I have one that is 11 years old when it’s 10 years old I have one it’s only seven months old she’s a chi she only weighs two and a half pound.. I had a little boy would be 19 in April he died right before Christmas and breathing problems oh my OMG it tore me up. Also had a little girl that was I inherited from my ex-husband he passed away and I took her course I had her around me for 11 years and a bigger dog attacked her no matter what my daughter and I did we cannot get her away from that dog and she died from her injuries try to get her to the vet. That was so horrible too. I really love my babies My little rat Terrier Missy Jean is a sweetheart. Mouthy little sweetheart Bitty Jo is 10 years old she rat terrier Shar Pei Shepherd Lab and chi also.. she is a sweetheart really laid-back like a lab. She is not a big dog only weighs 8 to 10 lb. My little G my newest when it’s 7 months old “Elsie” after the cow. She is marked like a cow. She is also a ! She has her feisty moments. I would take nothing for any if them. Her mother recently had another litter and one only weighed 1 half if a pound. She lived for 5 days. My sister did everything she did to,keep her alive. She was strong fir the first 4 days. She was nit as long as a pet bottle. The vet said it could be touch and go. It is very hard to raise a premed. My “Izzy Bell” is a Chorkie a little over a year old. She is devoted, loving, loyal, energetic, playful, and about the cutest little thing I’ve ever laid eyes on. She is definitely her Mommy’s baby too, strictly my baby girl, always at my side or in my arms. She has the most expressive little face, and I can most of the time tell exactly what she wants just by the expression on her face when she looks at me without her having to make a sound. She loves to play ball, that is her favorite game, tug-f-war being second in line. I could go on four hours about her. She is my baby and I would protect her with my life, just as I would any of my “birth” children. we lost our daisy on dec. 16th. she was having breathing problems and in pain. the vets did not know what was wrong. i miss her despretely. she was a great companion. i want another one but mom said no! I just rescued a teacup chihuahua and am having issues altready. She is scared and doesn’t seem to trust me. She is having potty accidents often. I got her two days ago and am trying to assure her that she’s safe and loved. I have a Chihuahua. Cooper is my baby boy. I love him so much he is so sweet. He loves my wife and I and is very protective. I have a chihuahua rat terrier mix puppy she is 14 weeks old now . I am wondering about her eyes seem to water a lot is that normal.